The most common complaint that the patients come up with to a dentist is toothache and the frequently heard term by them is root canal treatment. It is a simple chairside procedure done to save the tooth that has been affected by caries severely, infecting the pulp of the tooth, and sometimes extending beyond the apex of the root of the tooth, infecting the surrounding peri-radicular tissues, and also in some other cases as discussed below. Once the carious process reaches the third layer (soft tissue-pulp) of the tooth, the only two options left to save the tooth in a mature adult tooth are either extraction or root canal treatment (RCT). The tooth needs to be assessed and evaluated to check for the prognosis and decide the treatment. As the name suggests, RCT is associated with treating the canals of the root of the tooth. The procedure can be divided mainly into three processes, namely, getting access to the canal, cleaning, and shaping of the canal and finally refilling the space within the canal with an inert material. After doing all the required basic history taking (personal, medical and regarding the complaint of the patient), doing clinical and radiological examinations (OPG or IOPA X-rays), diagnosing and treatment planning, the procedure is carried out. Being a chairside procedure, it is done under local anesthesia. Once the tooth is anesthetized, the dentist opens and cleans the cavity, reaching the canal opening. After which, the remnants of dead pulp and debris are removed followed by cleaning and shaping of the canal and disinfecting it. Sometimes, when the infection is chronic or has reached beyond the tooth within the bone, the first appointment ceases here with the application of intracanal medicament (Calcium hydroxide dressing). In other cases, it can be completed within a single visit. The second visit or the last process involves filling of the cleaned and shaped canal with an inert material (Gutta-percha) in order to prevent any reinfection, mainly any retrograde infection. Following all this, the cavity is sealed with a temporary filling for 5 to 7 days and if there are no symptoms within those days, it is changed to a permanent filling and a crown is placed. Again, simply a crown or post and core is based on the remaining tooth structure and other prognostic factors. Kindly advise the treatment for sensitive tooth. Most of the time, the RCT term being a cliched one, brings in fear in the patient. But, though the procedure seems to be vast, there is nothing dangerous or painful to be worried about. All the concerns of the patient are taken into consideration by the dentist and the patient is always welcome to talk about the doubts and fears to the doctor. Deep cavity reaching pulp (pulpitis). It shows the symptoms like pain, through a chronically infected tooth might be symptomless and can be diagnosed during a routine dental examination. Periapical infections (infections reaching beyond the tooth root via tooth pulp) like a cyst, abscess, etc., showing pain associated with swelling or sinus opening or discharge, even symptomless sometimes. Non-vital tooth due to a previous injury (mostly, discolored). Recent trauma or fracture of tooth exposing pulp frankly. An avulsed tooth (tooth coming out of socket due to trauma and remaining outside for a long extraoral time or in a wrong or no storage medium or turning nonvital after replantation into tooth socket). 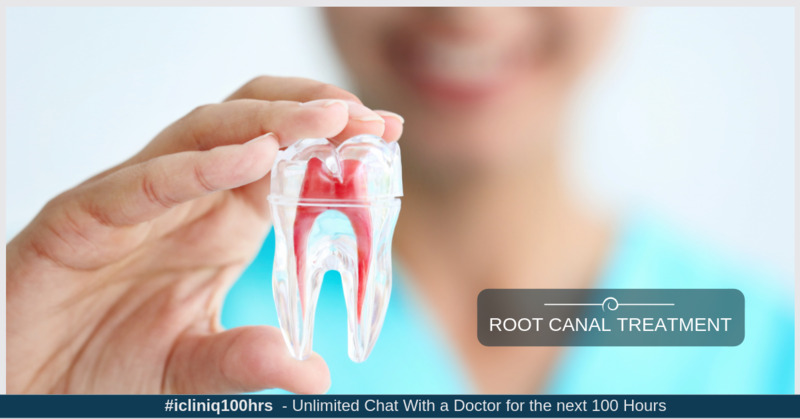 Intentional root canal, when the size of the tooth has to be reduced or altered for placement of crown or bridge or correct occlusion during any esthetic or functional dental treatment. It is necessary to do the RCT in such scenarios as leaving behind the infected, necrosed or diseased pulp within tooth might cause infection, pain and swelling in future and might even communicate to other vital spaces and structures making the condition more serious. Anatomy or morphology of the tooth: Extra root canals, lateral canals, pulp stones, curved canals, etc. Errors during the procedure: Instrument breakage, perforation, zipping, over or under instrumentation (going beyond apex of the tooth or finishing way before reaching the apical working length, respectively, so on. Patient factors: Stressed or anxious patient, anesthesia not working properly. There may be a dull aching pain post RCT for 3 to 5 days (maximum 7 days) which is common during the healing period, but if the pain is severe and continues for a prolonged time or the pain subsides but recurs again after 5-7 days, it is advisable to consult your dentist again. For the dull aching mild pain, the analgesics prescribed by your dentist can be taken in the prescribed doses. It is very important to continue and finish the antibiotic course prescribe by the dentist even if the pain, swelling, and infection subside. 2. Any hematoma (localized blood collection) or swelling or paresthesia (partial numbness even after the effect of anesthesia goes off). These are very rare complications and should be brought to the notice of the dentist as soon as possible. The injection of this solution beyond the apex of the tooth may lead to toxic tissue reaction and show the following symptoms: Severe immediate pain, swelling, bleeding from tooth as well as within tissues. To manage this, ice pack compression can be done for 24 hours (15 minutes interval) to reduce swelling and post that warm, moist compression can be done (15 minutes interval). Analgesics prescribed by your dentist can be taken for pain relief. 4. Unnoticed crack in root or missed lateral canals: These can be a source of reinfection and need the attention of the dentist. The major cause to face RCT is tooth cavity which can be prevented if taken proper measures, like maintaining good oral hygiene, visiting the dentist once a year for a regular dental checkup and getting caries (cavities) filled in the initial stages itself, if any. In case of any trauma to the tooth, visit the dentist as soon as possible. The major fear and dilemma among the patients regarding the RCT is due to pain and neglecting the importance of the tooth. It is always a better option to save the tooth instead of removing and replacing as the function of the natural tooth can never be mimicked by artificial tooth. It is important to be aware of the precautionary as well as the treatment aspects of tooth-related conditions. As the online medical platforms have made the patient-doctor communication much simpler and convenient, when in doubt or if you have any symptoms or notice anything different or unusual from normal in your oral cavity, it is advisable to consult your dentist online with just mentioning the details of complaint, sharing images and X-rays to get detailed knowledge about the condition and the available treatment for the same. Do you have a question on Dental Fillings or Dental Scaling? Can root canal treatment be done on a small kid?